One of the best parts of booking a cruise with Carnival Cruise Lines for vacation is that all of your meals are included. And when I say ALL, I mean ALL OF THEM – 24 hours a day, as much or as little as you like! 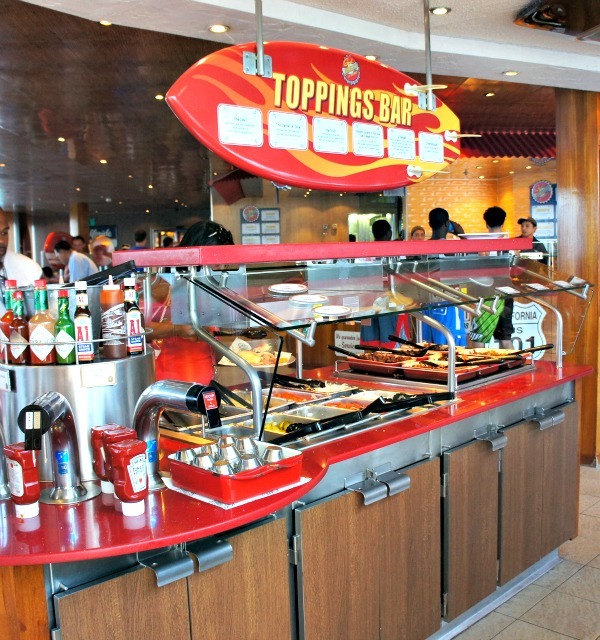 There are buffets for breakfast, lunch and dinner, 24 hour room service, fine dining in the assigned dining rooms, 24 hour soft serve ice cream machines and specialty restaurants on Carnival Cruise Lines that will fill your belly with deliciousness and your heart with joy. Seriously. 24 hour soft serve ice cream and pizza, people!! 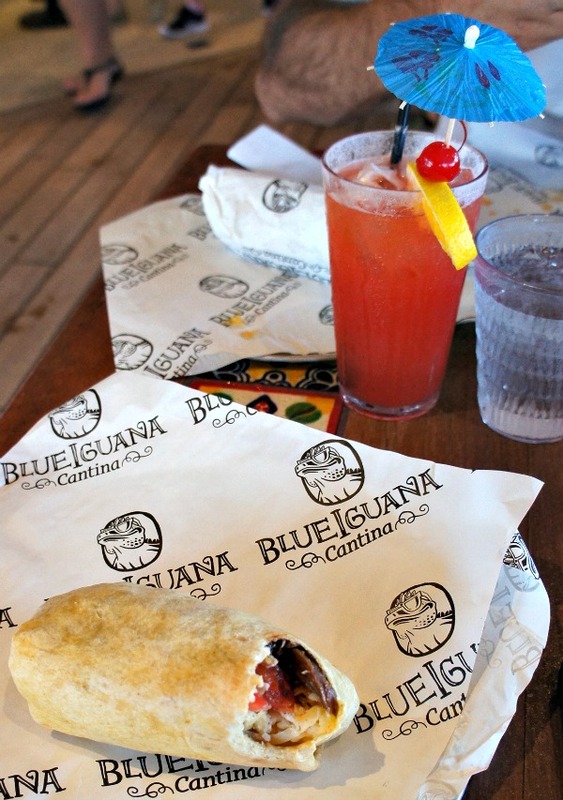 While sailing on the Carnival Liberty in June, Chris and I loved the BlueIguana Cantina and Guy’s Burger Joint, so this story will mostly focus on them. If you like burgers and burritos, you’ll probably spend all of your lunches there too! 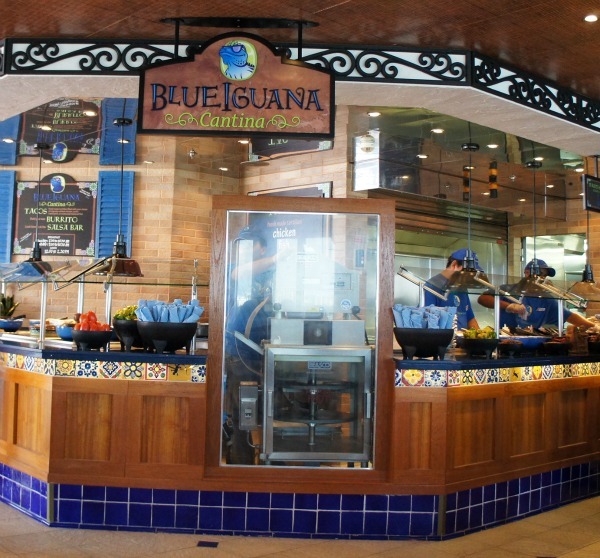 Carnival says “Nobody knows Mexican dining like a blue iguana.” I’ve never met a blue iguana, so I’ll take Carnival’s word for it because the food is absolutely delicious! 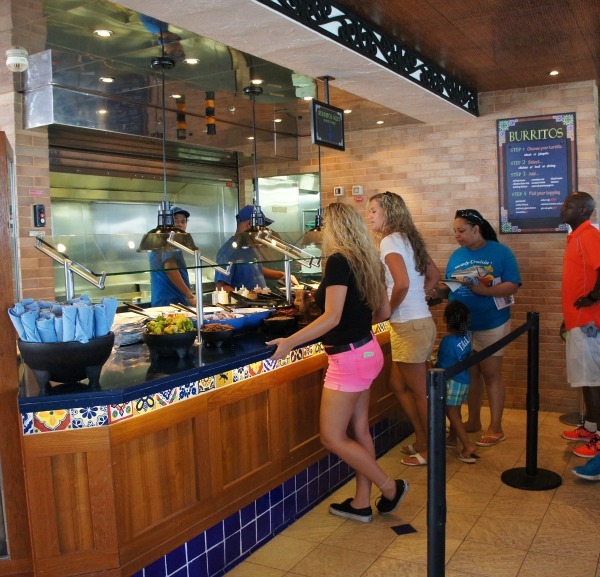 The brand new Blue Iguana Cantina allows you to choose your tortilla and stuffings for freshly made tacos and burritos for breakfast and lunch! You choose the type of tortilla, the kind of meat you’d like as well as the cheese and fixings, and they make it fresh for you right there! You can choose from wheat and Jalapeno burrito tortillas, shrimp, chicken or steak meat (and the tacos have the option of fish, pork or chicken), then lots of toppings like Monterrey Jack cheese, tomatoes, pico de gallo, roasted corn, lettuce, grilled onions, black beans, refried beans, yellow rice, etc. There are even lots of sauces to add: tomatillo, roasted tomato, crema frescha, etc. There was usually a bit of a line, but only a few people long and the guys moved so fast that the wait was never more than five or ten minutes! What we especially loved about them was that they served breakfast burritos and tacos too! 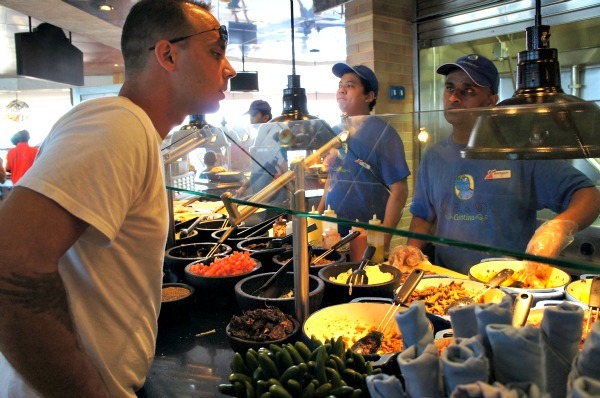 And there’s a lovely salsa bar where you can add all kinds of toppings – I’ll warn you that the Habanero sauce? It’s freaking HOT. The flavors are authentic – this isn’t Taco Bell, people! The burritos and tacos reminded me of the delicious Mexican food I ate in Mexico City, and Chris was a huge fan too! 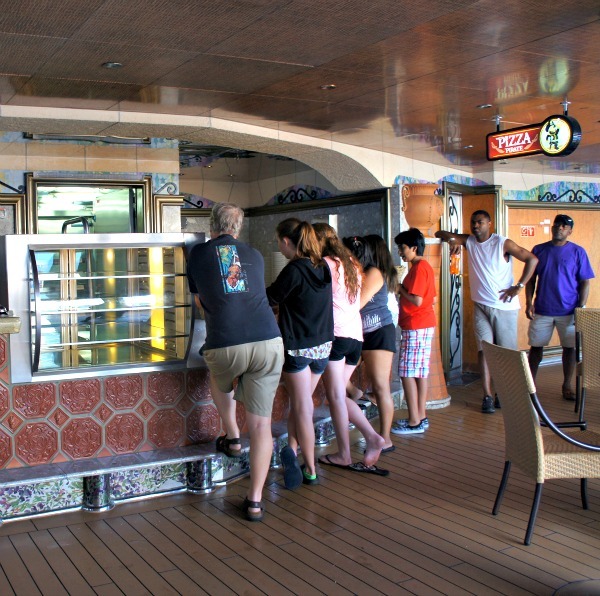 Now, Chris and I love us some juicy hamburgers, and that’s not something you usually expect to find on a cruise ship. 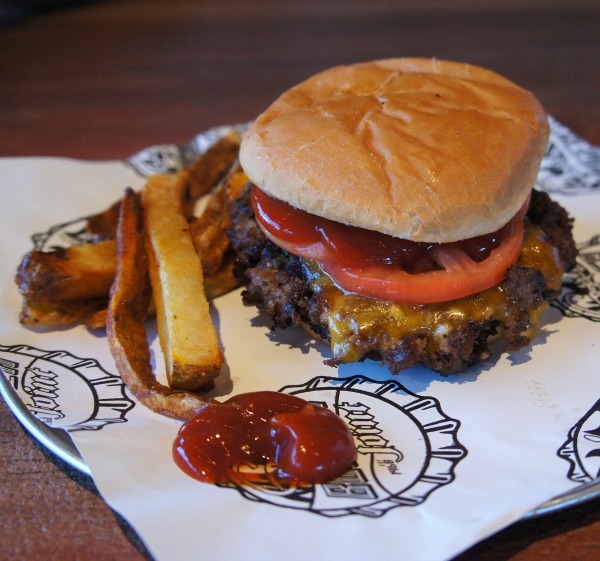 Lucky for us, Guy’s Burger Joint is one of the specialty restaurants on Carnival Cruise Lines and there was one on the Carnival Liberty! Guy’s Burger Joint runs so smoothly, they always have freshly made burgers and hand cut fries ready for pick up, so even if there’s a line, it moves so fast that you’re not really waiting! Then there’s the Pizzeria. It’s open 24 hours a day so it’s perfect for those 2 a.m. cravings. And if it’s dinner in your bathrobe that you’re looking for, order complimentary room service, available 24/7 – there’s just an extra charge for sodas and alcohol, which is true everywhere on ship. Like your meals low-key and prefer to skip the dining rooms with more formal fare? You’re in luck, ’cuz there’s lots of awesome options for casual lunches and dinners. 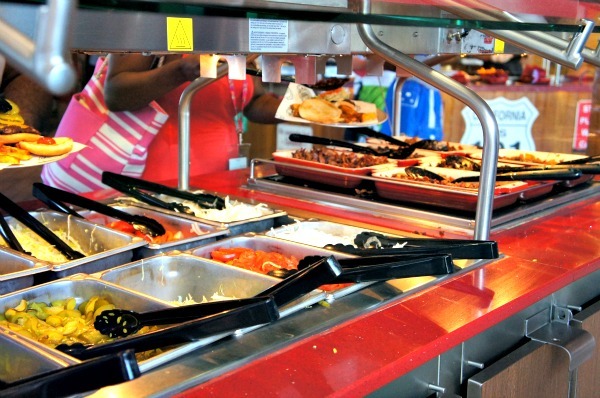 First, try the Lido Deck Buffet, usually called “Good Eats”. Grab some delicious food and sit anywhere you like … fancy an ocean view? Grab a seat by the window on the Lido Deck or pile your plate high and have dinner on your lounge chair by the pool or take it back to your stateroom and put that balcony stateroom to good use! Now, there are specialty restaurants on most Carnival ships that charge an additional fee, like the Diamond Steakhouse on the Carnival Liberty, or Fahrenheit 555, Jiji’s Asian Kitchen and Cucina del Capitano on the Carnival Sunshine, and prices range between $12 and $35 (the steakhouses are usually the more pricey ones) per person. While on the Carnival Liberty, we were invited to a complimentary dinner at the Diamond Steakhouse by the manager and our dining experience was so incredible – it was honestly the best steak I’ve ever eaten – that I now can’t see NOT making reservations at least once while on our next cruise! 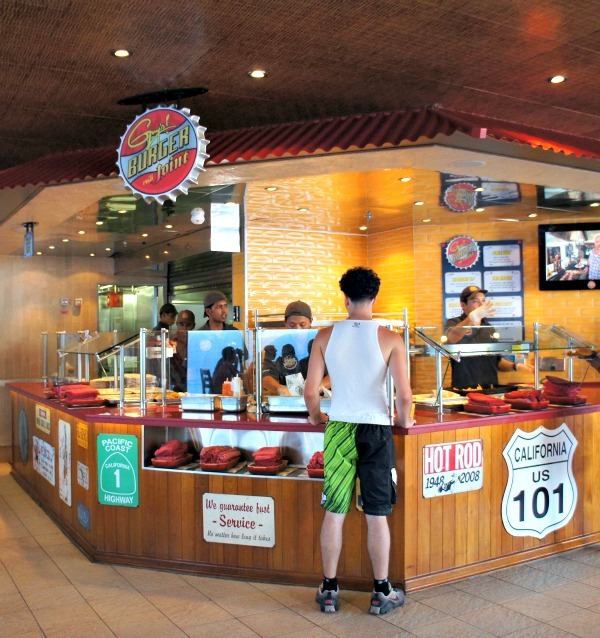 No matter where you have your meals on your next Carnival cruise, I just know that you’re going to love it! P.S. 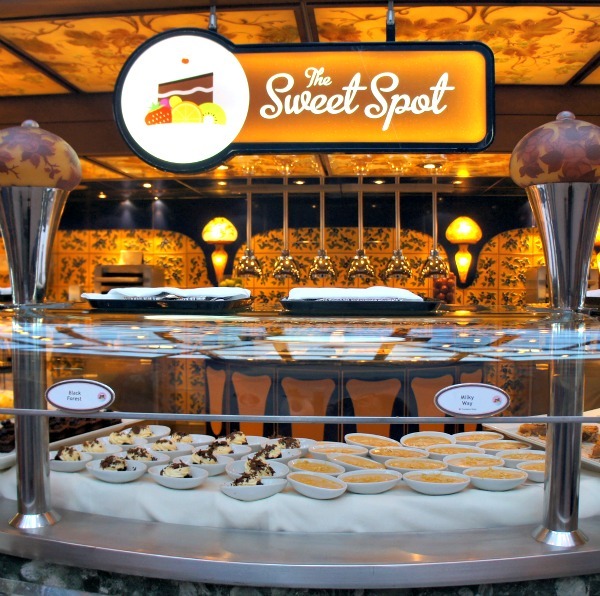 Don’t miss the Chocolate Extravaganza on the Lido Deck restaurant on your Fun Day at Sea!